When most people think of asbestos they think of a cancer causing agent used in construction products years ago. After all, for most of the twentieth century, it was used pervasively in everything from the insulation in the walls to the sheetrock forming those walls, and from the ceiling tile overhead to the shingles up on the roof. Throw in things like circuit breakers, furnaces, bricks, wire, gaskets, plaster, flooring, paint, caulk and sealants and it becomes clear that much of the components used to construct a home or building up until about 1980 had asbestos in it in one way, shape or form. Most people are also now aware that asbestos is a devious product that has led to countless cases of cancer and, sadly, countless deaths as well. Whether it is on a personal level through a loved one, friend, or co-worker, or just through reporting in the daily news, asbestos and the havoc it has wreaked on the population has touched us all. Words like asbestosis and mesothelioma have entered the American lexicon and are not likely to leave any time soon. Thankfully, though, the use of asbestos in such products stopped decades ago. The risk of cancer at the hands of asbestos should be a thing of the past then, right? Wrong. Some jobs still expose workers to its hazards on a daily basis. Yes, most products are not being made with asbestos anymore. But what about the millions of products and installations already in existence? For example, if you live in a house or work in a building constructed in the seventies or before, chances are ample supplies of asbestos are present. But what’s the danger in that? Well, if left alone, perhaps none or very little. It is dangerous once that asbestos is touched. Tiny microscopic asbestos fibers will be released, and once released, those fibers can be inhaled. Its cycle of destruction can then unfortunately begin anew. Ok, but in today’s day and age, people are well aware of asbestos and take precautions when dealing with it in older homes and buildings, correct? Hopefully. If someone is planning on tearing down or rehabbing an old building, the law requires contractors to take the necessary precautions to keep the asbestos contained. But can you think of a situation as a firefighter where that tear down or rehab is not planned? A fire! If an older home or building catches fire, no one has time to “contain the asbestos”, all the firefighters are concerned with at that point is saving lives, and if possible the building itself. Taking an infamous national tragedy as an example, think the first responders to the World Trade Centers on 9/11 paused to consider the risks of all those building products burning, collapsing, and releasing microscopic fibers? Not for a second. That’s not how they, or you, think. You can’t afford to. And while absolutely heroic and unquestionably necessary, in doing so firefighters expose themselves to the risks of asbestos, lung cancer and mesothelioma. 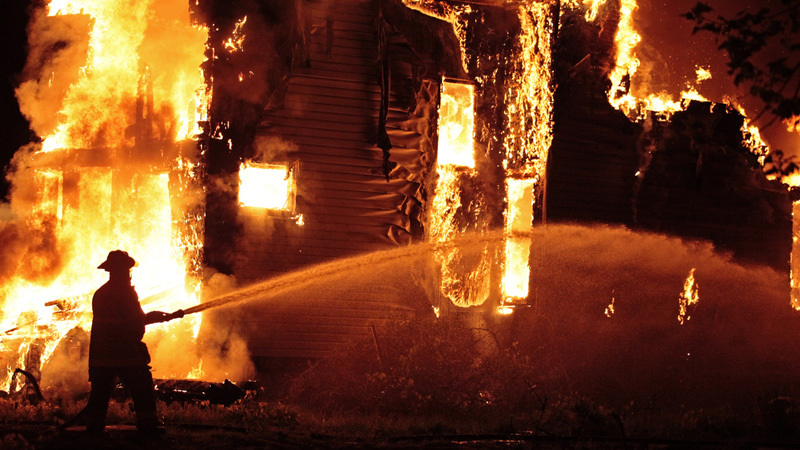 For not only does the fire itself disturb the asbestos and cause fibers to be released, but the exposure is often exacerbated by the firemen needing to break through walls and other building components containing asbestos to save the lives of those inside, and ultimately put out the fire. Most discouragingly, these acts happen all the time, every day in every fire station and first responder brigade across America to this day. That’s where Asbestos Disease, LLC can help. We know asbestos and the diseases it can cause. The good news is that we also know how to help firefighters and their family members who were exposed to asbestos get the medical and legal expertise they need. No cure is known for mesothelioma, but treatments are available, and the quality of life afflicted by it can be improved. No one wants to think about legal action when such a disease is diagnosed, but the courts are on your side and justice can be obtained, be it through a judgment of wrongdoing or the award of monetary damages. The parties responsible for manufacturing and installing that asbestos may never meet you, but that does not mean you have to pay for their mistakes. After reading this, take a moment and think about your exposure. Think about your options and think about your family. And then, finally, think about yourself. You’ve been selfless for long enough. It is time you ask us for help. We can be reached toll-free, twenty-four seven, at 1-800-547-4189. I had no idea that fire fighters were in so much danger of asbestos exposure. Kinda makes sense, now that I think about it. This is great info to share… my nephew is a part of the fire department in Des Plains.